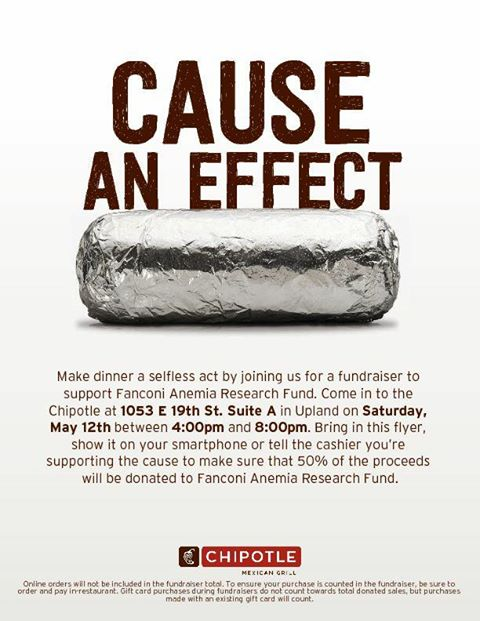 You can help fight childhood cancer by eating at Chipotle Mexican Grill. Colton Fire engineer Ryan Foulks passed away recently and the folks at MOD Pizza are hosting a fundraiser for his family. MOD Pizza today (June 26) launched its first “Impact Pizza,” the sales of which will help generate funds for a nonprofit organization. Sales of the pizzeria’s new Isaac pizza will benefit The Jed Foundation, which is dedicated to protecting emotional health and preventing suicide for our nation’s teens and young adults. ABC7’s annual Feed SoCal food drive runs through July 1. Food donation bins have been placed throughout Southern California, including Vons and Albertsons markets, at Subaru dealerships, and other drop-off locations, like Kudos Pizzeria in Rancho Cucamonga. Chipotle Mexican Grill locations across California are hosting a fundraiser for Special Olympics tomorrow (June 14). To participate, all you need to do is dine at Chipotle, mention the fundraiser and the chain will donate 50% of your bill to the cause. Redlands’ third Jersey Mike’s Subs, will open tomorrow (May 23) in the Packing House District. The new location, 400 Stuart Ave., Suite 100, is hosting a fundraiser through Sunday (May 27). This Saturday (May 12) is the 26th annual National Association of Letter Carriers’ Stamp Out Hunger food drive. Which means you can help fight hunger just by going out to your mailbox.